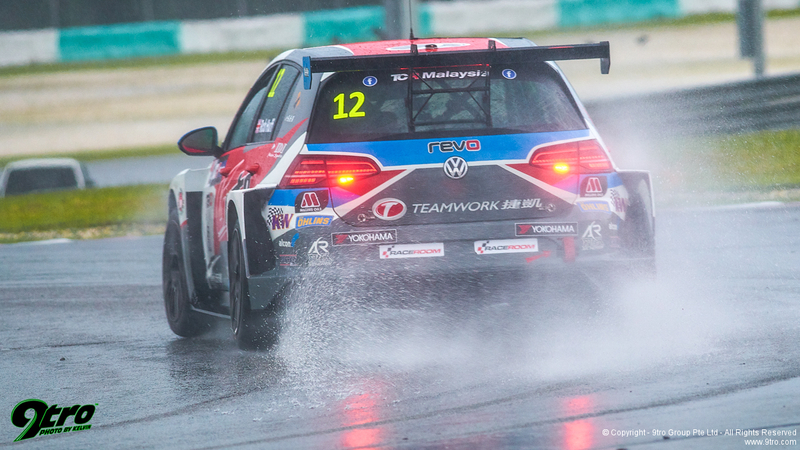 Engstler weathers the storm to dominate in Malaysia. 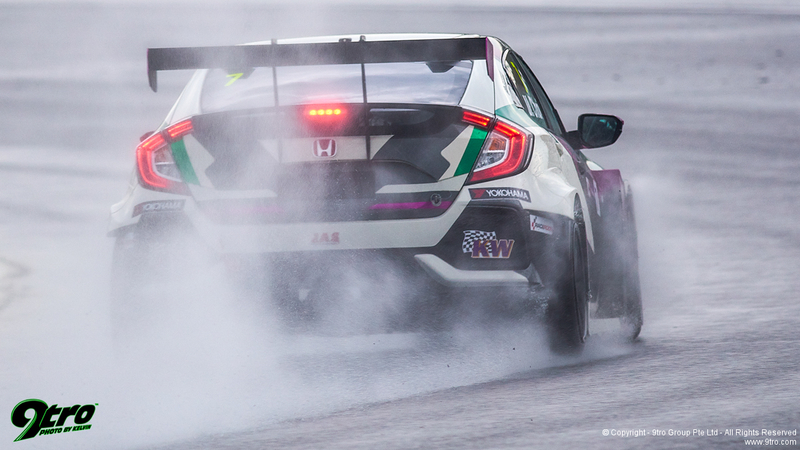 Sepang, Malaysia - Reigning TCR Asia Series champion Luca Engstler opened his 2019 account in fine form during the maiden event of the new TCR Malaysia Championship at Sepang International Circuit, the Liqui Moly Team Engstler teenager weathering a storm from first, 2012 World Champion Rob Huff, and then torrential rain in race two to claim back-to-back wins in his #8 Hyundai i30N TCR and take a strong points lead into the second event in just six days time. 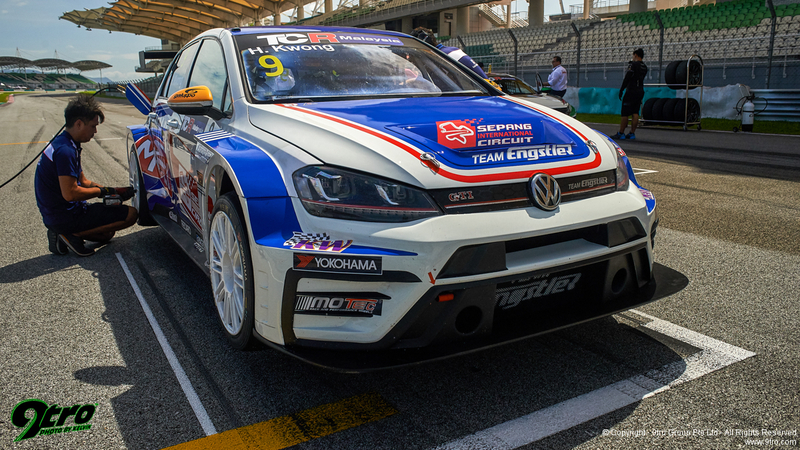 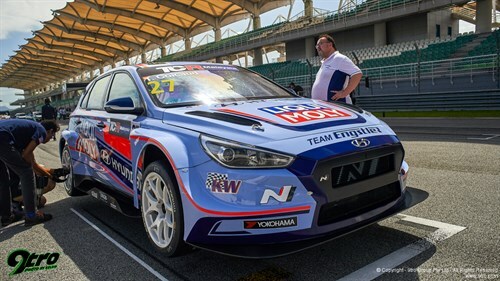 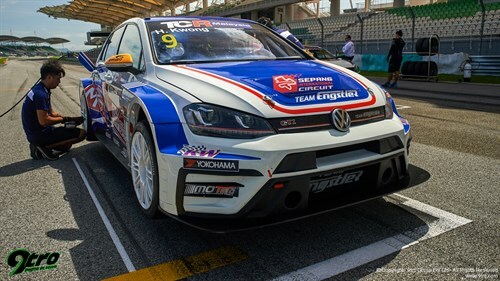 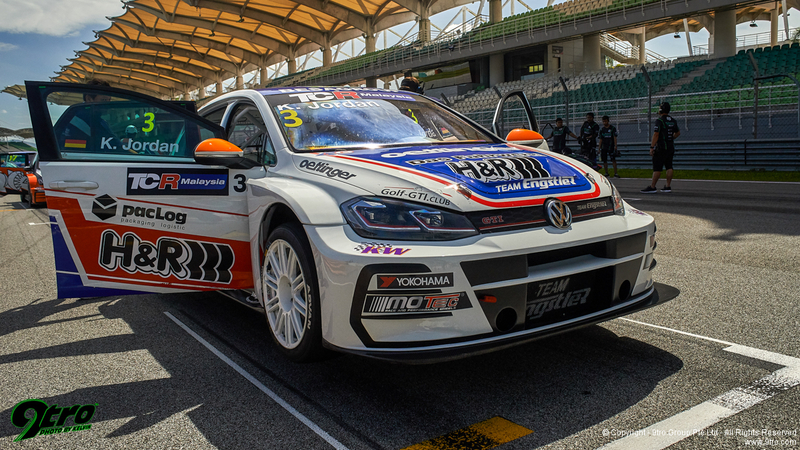 Engstler had topped the time sheets in pre-race testing at Sepang, then both practice sessions clear of late TeamWork Motorsport entry Huff, who despite having been involved with the Hong Kong-based team for many years, had never raced a TCR car for them, although the ‘King of Macau’ was well versed with the Volkswagen, having campaigned one for Sebastien Loeb Racing in WTCR last season (placing eighth for the season with two wins). 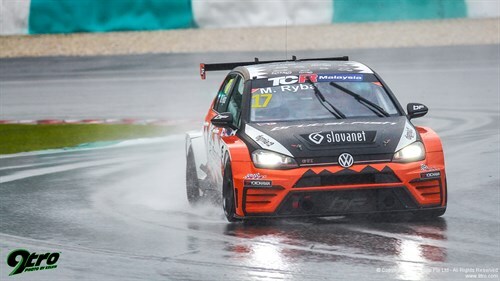 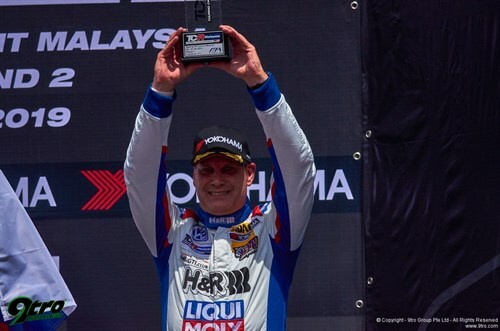 By qualifying though in the ‘cool’ of the night under lights at Sepang Circuit, Huff delivered, claiming the top time in both sessions to have pole for the opening race, Engstler though not far behind, Huff’s best time in the end was just 15 one thousandths faster than Engstler’s TCR Asia Series record breaking pole time from April 2018.. 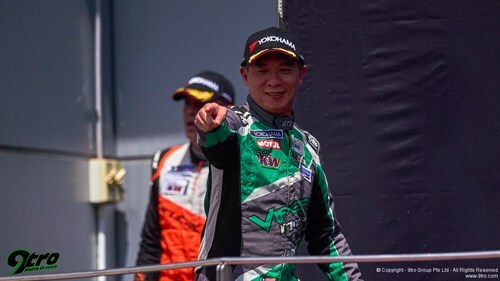 It was a sign of what was to come.. 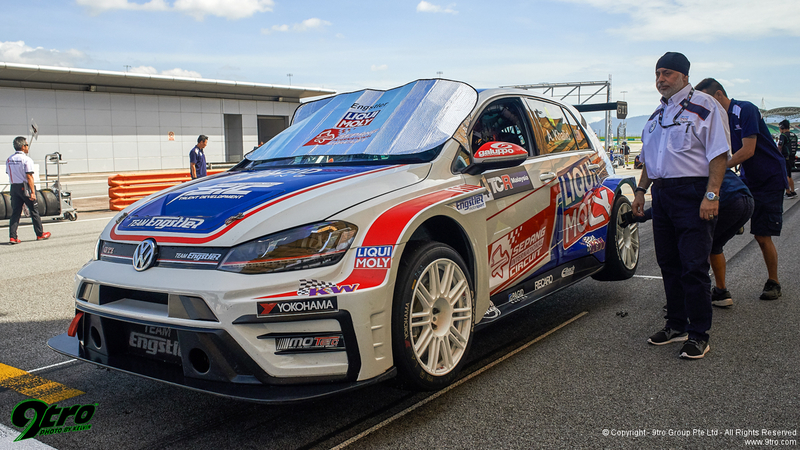 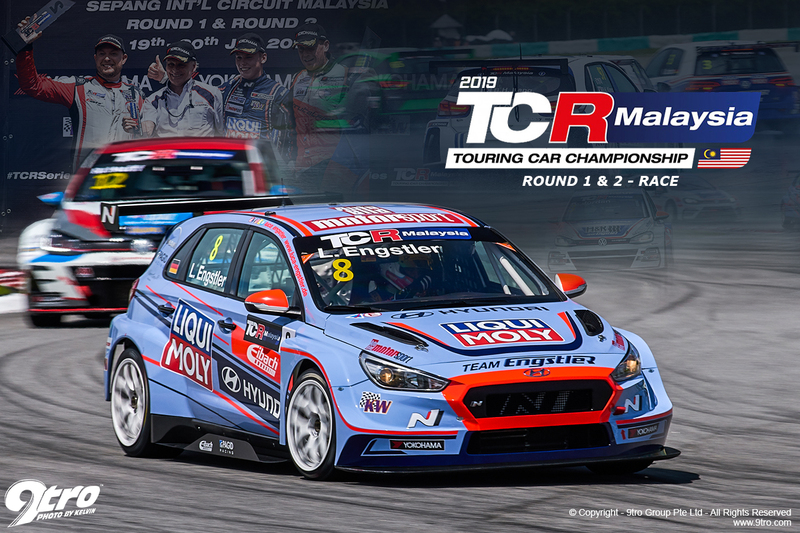 In the midday heat the teams lined up for the historic first race of TCR Malaysia with a world champion on pole, and a two-time TCR champion alongside. Off the standing start Engstler got a blinder and immediately jumped ahead of the Englishman before moving across to take Huff’s ideal line down to the tight first turn. 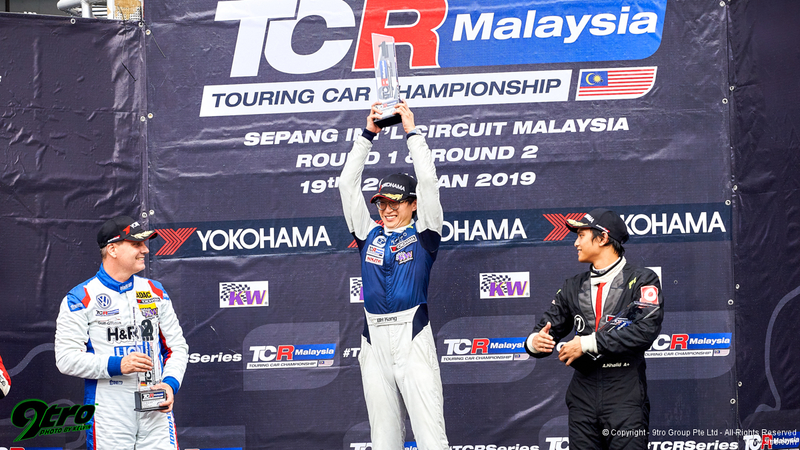 Theo Coicaud fell into line behind Huff, whilst Paul Ip took advantage of Charlie Kang’s slow getaway to be fourth, whilst Adam Khalid stalled on his first standing start, dropping back to rear of field. 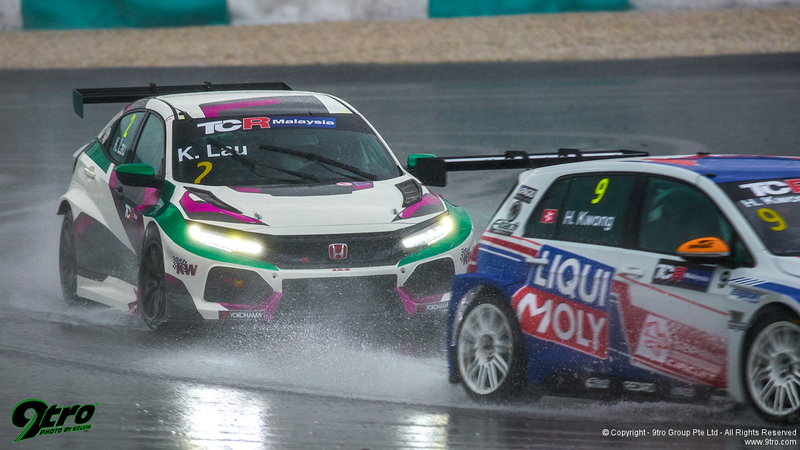 Engstler drove deep into turn one and locked a rear tyre, whilst behind the leading trio Martin Ryba forced his way up the inside of Ip for fourth, the KCMG Honda forced wide with Ip losing the tail of the car into turn two, dropping a position to Douglas Khoo in the process. 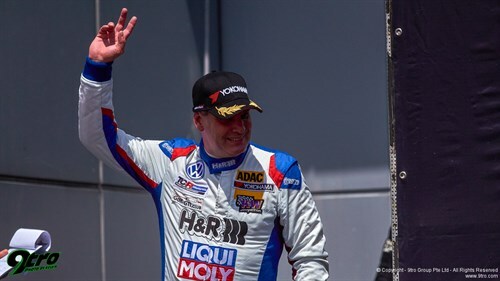 At turn four Huff feinted to the inside, forcing Engstler deep under brakes, more tell-tale smoke giving Huff a sign that he was putting the young German under pressure. 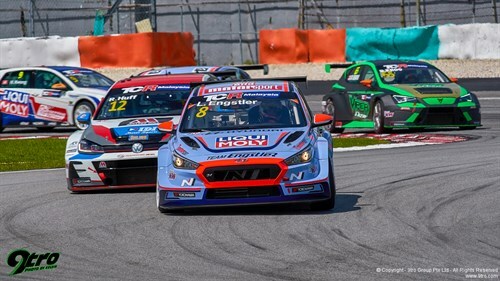 The two leaders worked their way away from Coicaud and the pack, but on lap three it all came to a stop as a charging Adam Khalid looked for an opportunity on Charlie Kang into the fast turn eight right-hander, Kang at the same time looking to put a move on Henry Kwong. 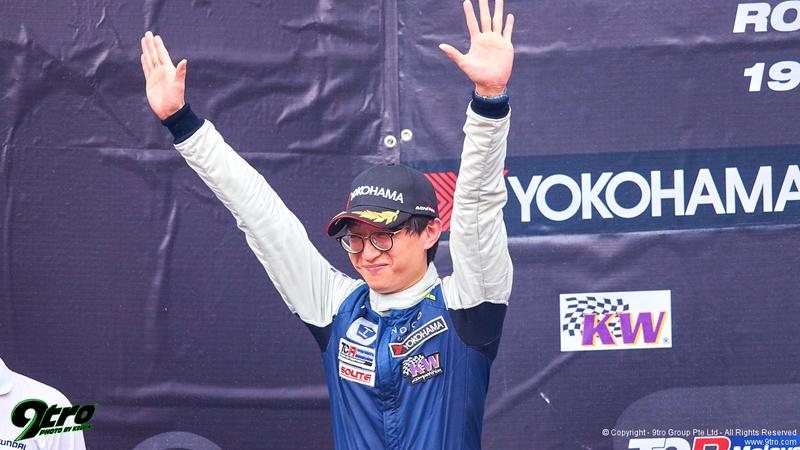 The young Malaysian open-wheel driver dived to the inside at the last second, making contact with the right rear of Kang’s TCR Korea winning Hyundai spinning him to the outside of the circuit and deep into the gravel trap - game over..
At almost the same time, Paul Ip’s right front steering arm let go of the wheel giving him nowhere to go on the outside of turn two, the KCMG team-boss forced into retirement, although fortunately, the fix was pretty straight forward for the team. 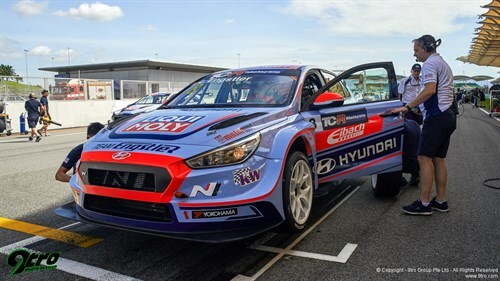 With little choice but to release the Safety Car, Theo Coicaud became the third retirement as he slowed to hold position, the French Liqui Moly Team Engstler Hyundai driver suffering a technical failure which would ultimately sideline him for the rest of the day. The Safety Car intervention lasted for two laps whilst the cars were recovered with Huff closing in on Engstler’s rear wing, the Englishman circulating within inches of the teenagers tail as the field prepared for the restart promising an epic conclusion to the race - and Huff didn’t disappoint. 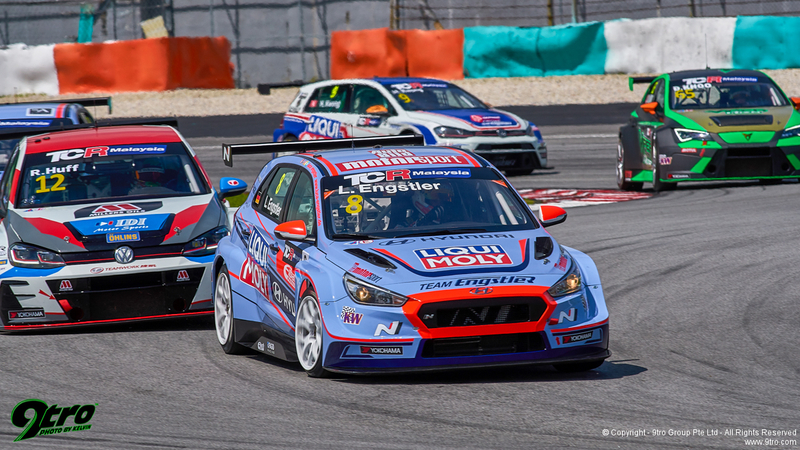 Engstler knew what was coming, and he pushed as hard as he could, locking wheels again into turn one and four allowing Huff to close to within a car length as they crossed the line with four laps to go. 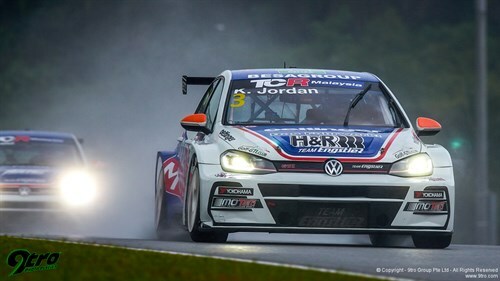 He took a look at turn one, then ducked back in behind Engstler although the German again went deep under brakes leaving an opportunity for Huff that was too good to pass up. He dived to the inside apex and poked the nose in, but Engstler knew he had the ideal line for the turn two left-hander so he focussed on holding Huff out to the turn-in point. Huff fell back in behind, but had better drive off the corner to pull alongside on the run through the fast turn three right-hander, the two making light contact on the exit at near 200kph, Huff muscling Engstler across the give him some room, but the Hyundai driver was having none of it, holding his ground as the turn four right-hander approached. 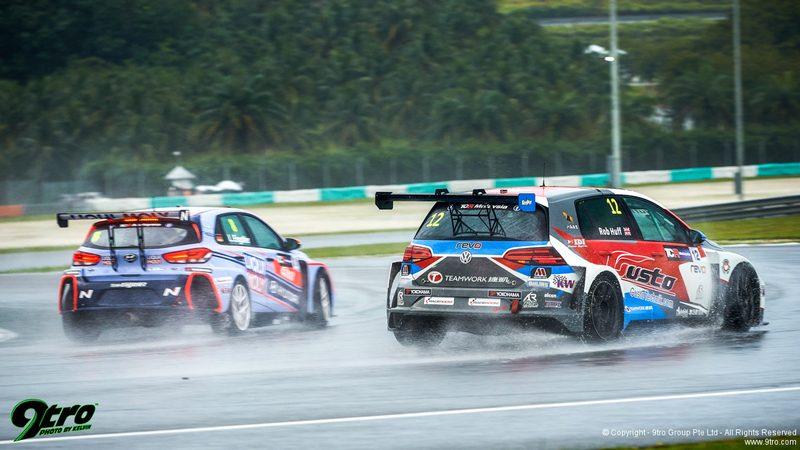 Engstler squeezed Huff to the extreme outside, and with brakes chirping, dived across to the apex to take back the lead. 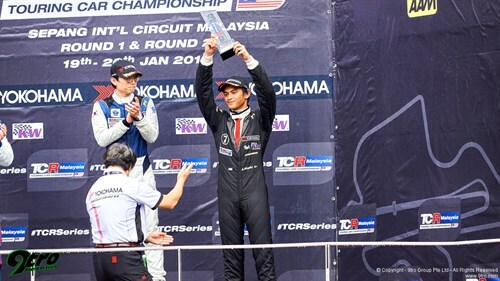 From there he set about focussing forward to the conclusion of the race. 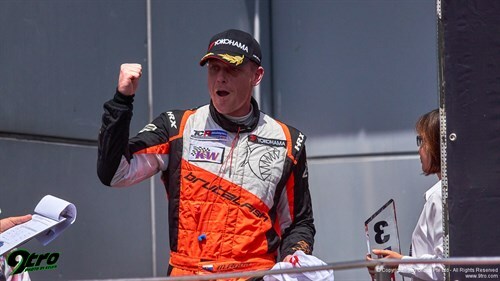 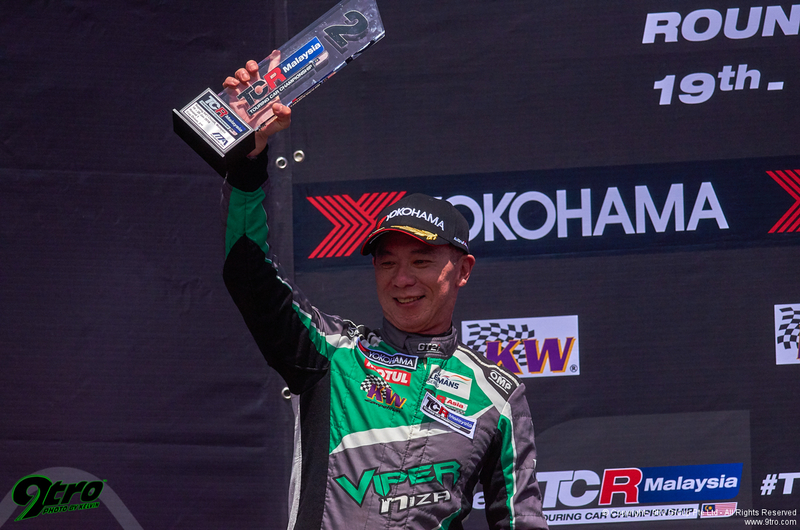 Huff was unable to challenge again and was forced to settle for second, with focus turning to the battle for third between TCR Europe’s Martin Ryba and local hero Douglas Khoo in the brilliant grey and fluro green Viper Niza Racing Cupra TCR. 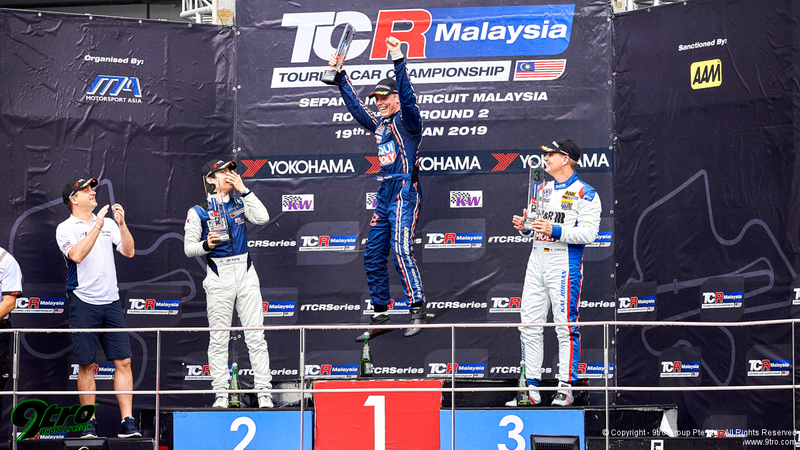 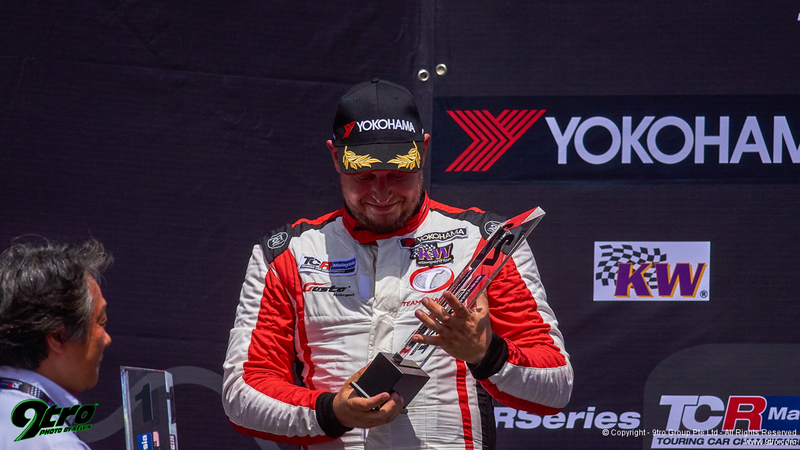 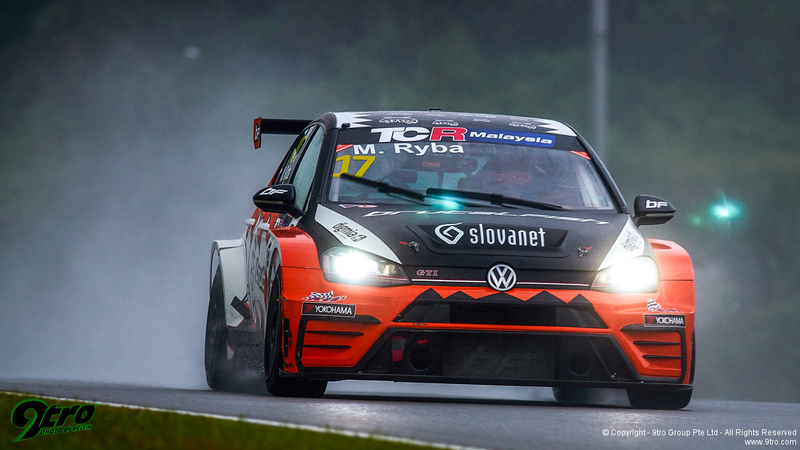 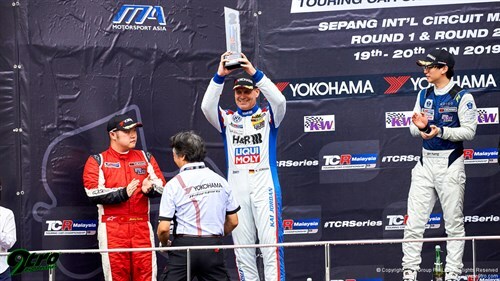 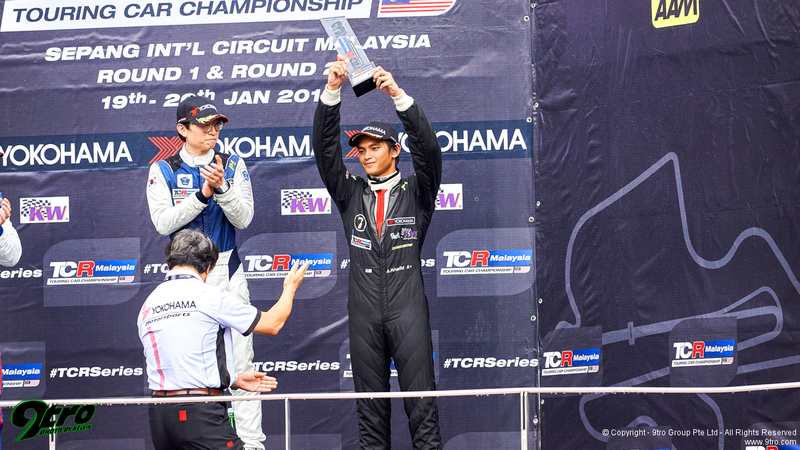 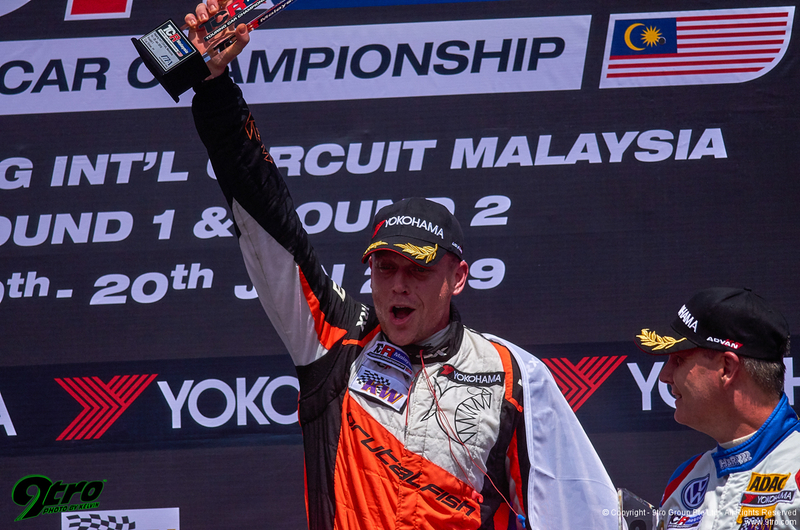 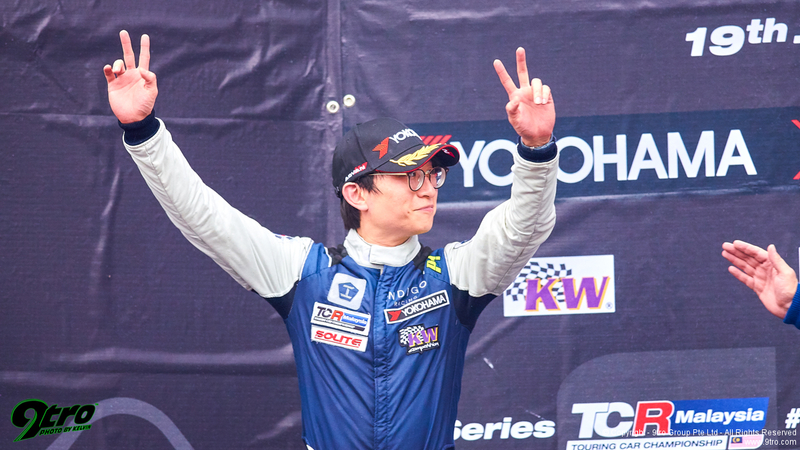 In the end Ryba prevailed for a podium finish, Khoo forced to settle for second in the TCR Cup class in one of his best drives in recent years. 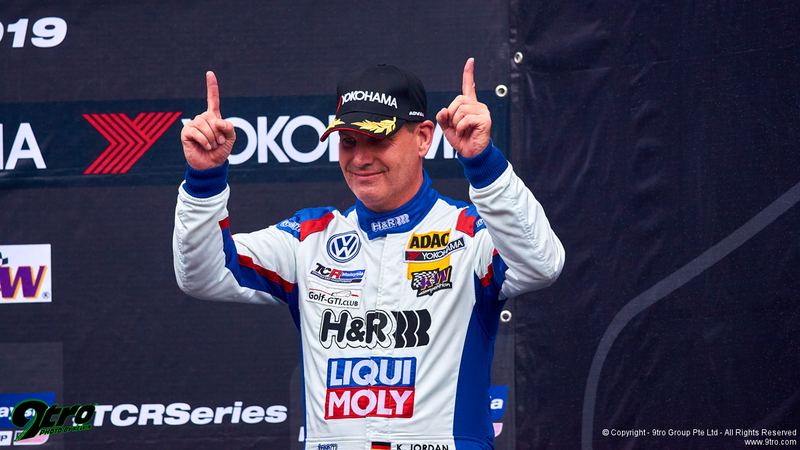 Kai Jordan finished a fine fifth in the first of the Liqui Moly Team Engstler Volkswagens, the TCR Germany regular holding out the recovering Adam Khalid, with Henry Kwong making it three team cars in a row ahead of Prince Racing’s 2015 TCR Asia Series champion Michael Choi and team-mate Kenneth Lau. 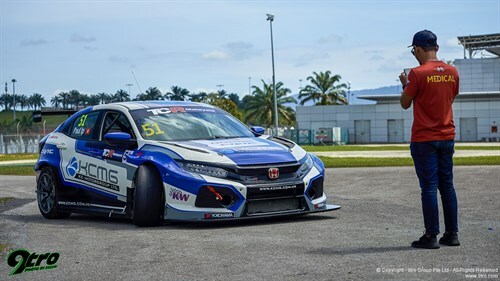 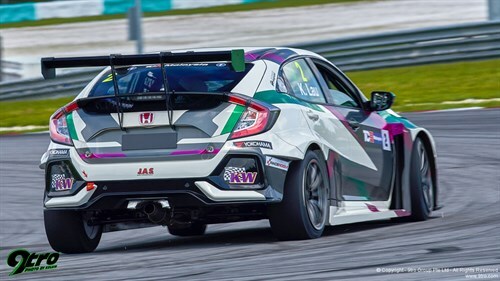 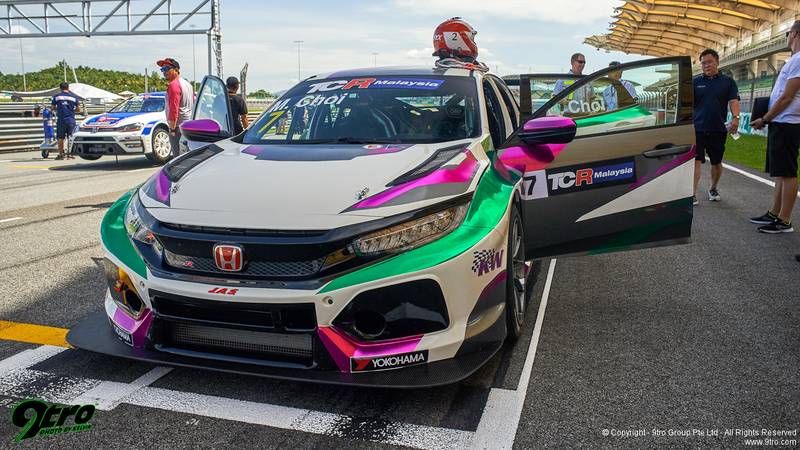 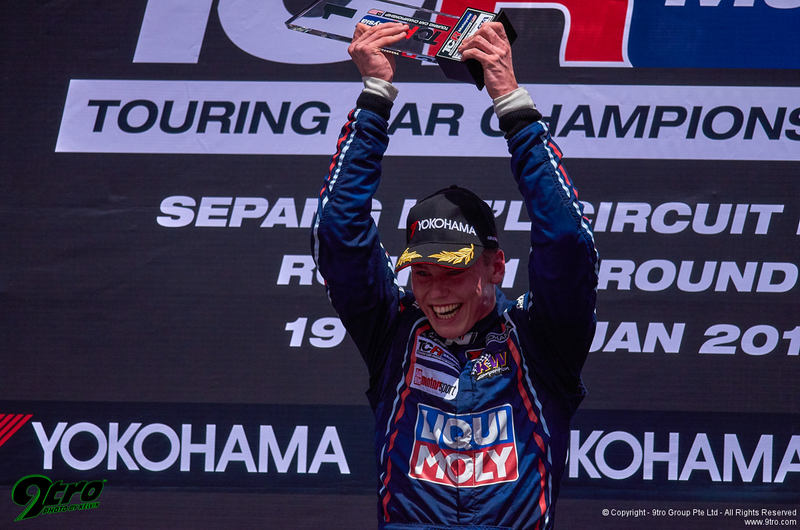 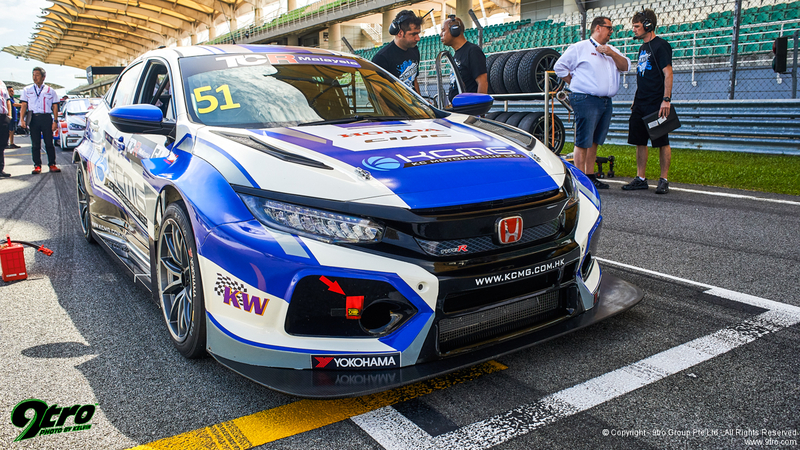 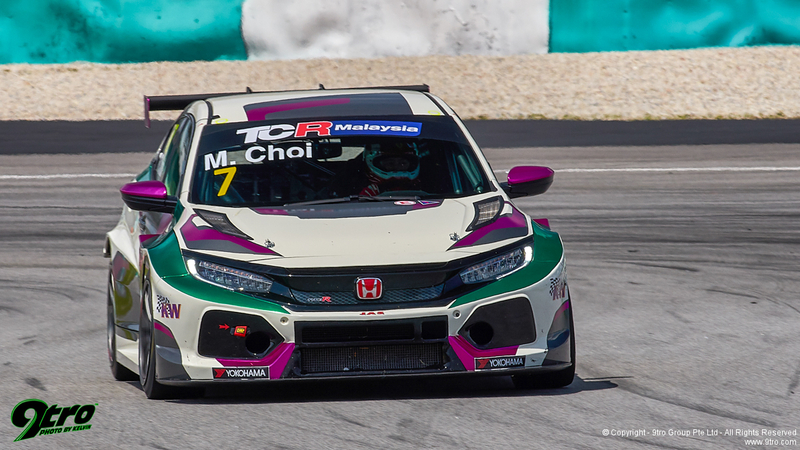 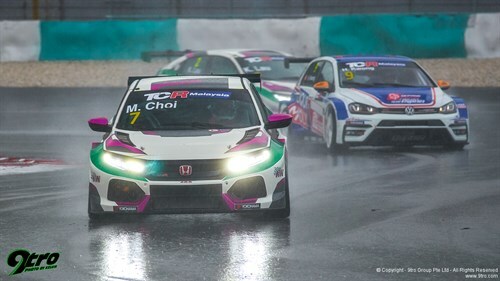 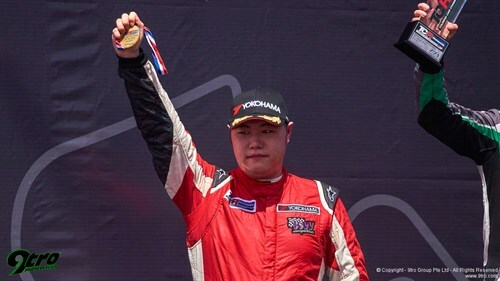 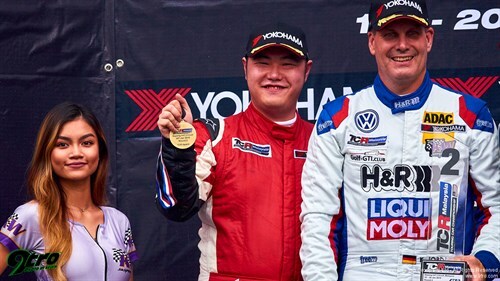 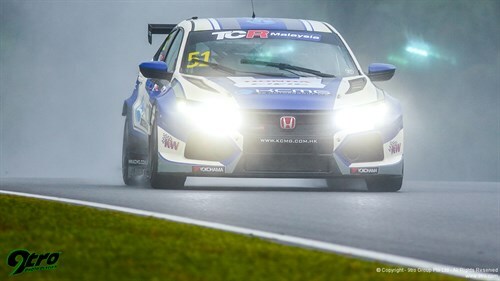 Fellow Hong Kong Honda driver Gary Cheung brought up rear of field in the Maximum Racing entry that took Lo Sze Ho to victory on the beaches of Bangsaen in TCR Asia last year. 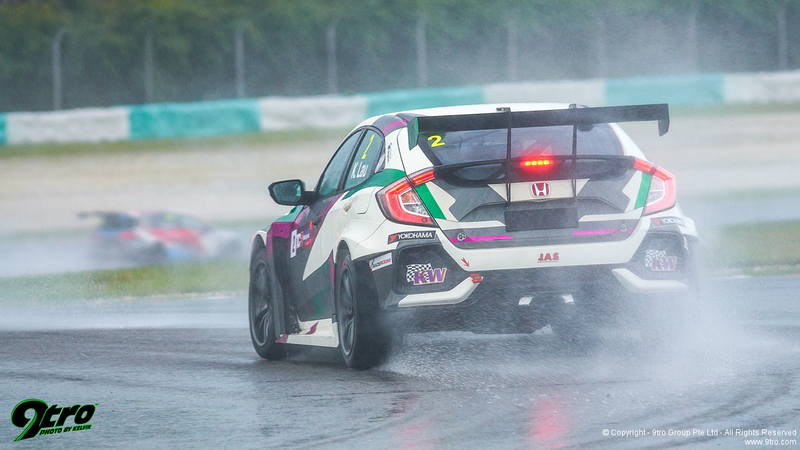 Menacing black clouds surrounded the circuit as the cars hit the circuit to prepare for the second race, but no sooner had the five-minute board been shown to signal the start of the race, than the heavens opened with a tropical deluge that continued for more than an hour. 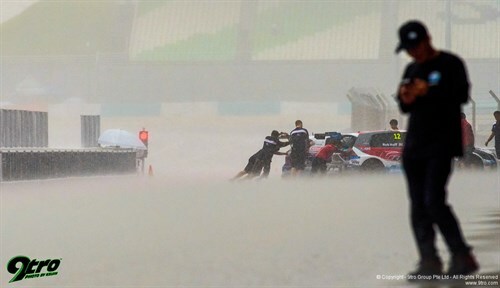 With torrential rain continuing the teams elected to put their cars back in the garage, but fortunately - as the final race on the program - officials held on and 90-minutes after the original scheduled start, the race began behind the safety car with a wet race declared. 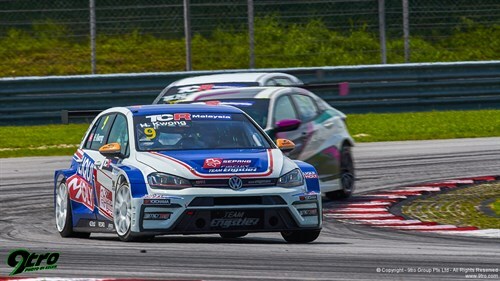 In the end the field circulated behind pole-sitter Douglas Khoo for three laps before being let go on the fourth, the Malaysian leading Kai Jordan, Adam Khalid and the recovering Charlie Kang down to turn four, but he was swamped by the two Liqui Moly Team Engstler Volkswagens within two corners before Kang moved to third at turn eight. 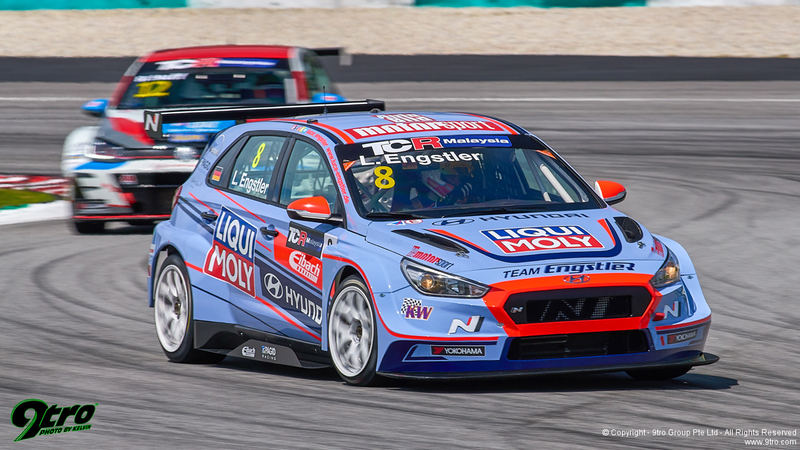 By the close of the lap Luca Engstler was fourth with Rob Huff fifth having made up just two positions whilst Kang made it through to second as Engstler approached. Going into the final corner the following lap, Engstler stuck his nose down the inside as Kang turned across to the apex, the two making light contact before the German dropped back to third, Huff still sixth with a pace almost three seconds a lap slower than his rival with the team having had to compromise setup in the testing conditions. It didn’t take long for Engstler to move through to the lead, with Kang making it a Hyundai 1-2 over the closing laps, Engstler continuing to push to gain some valuable data on the new Yokohama control wets to cross the line more than 12-seconds clear of the TCR Korea champion, with Kai Jordan a well deserved third. 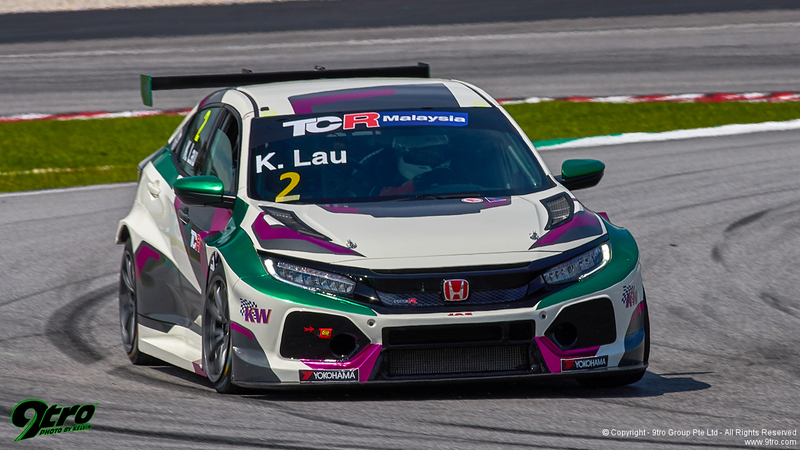 Adam Khalid finished a solid fourth on his TCR debut with Rob Huff a frustrated fifth. Paul Ip recovered from the frustrations of the opening race to be sixth ahead of pole-sitter Douglas Khoo, whilst Martin Ryba - much like Huff - struggled with a less than ideal setup in the slippery conditions to take eighth. 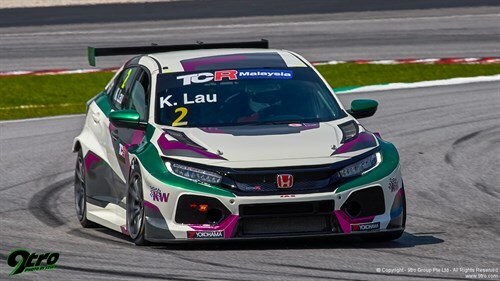 Henry Kwong’s return to a TCR car netted ninth and some invaluable laps of the Sepang circuit, whilst for Prince Racing team-mates Michael Choi and Kenneth Lau, the late arrival of their new cars gave them little time to dial in for the opening event, although with valuable laps under their belts, they could be expected to move forward by the time the championship returns next week. 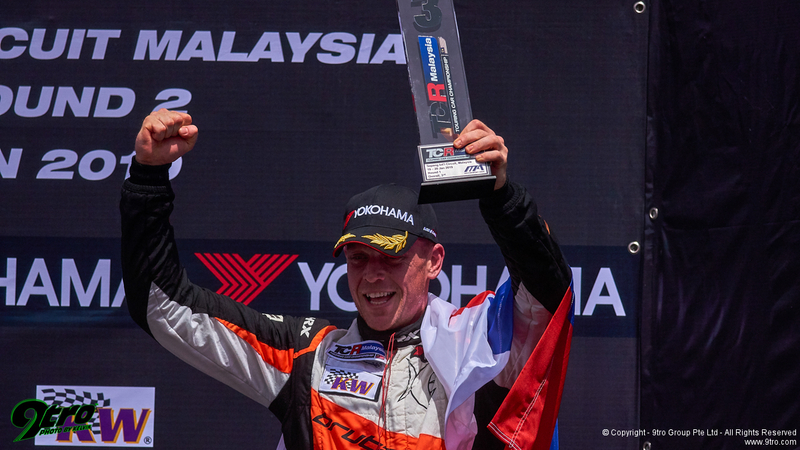 “I knew that I had to do a good start to overtake Rob [Huff] in the first lap. We were on new tyres so I just focused on the start and then I saw I can overtake him and then I tried to build a small gap. Then I tried to control the gap but there was no chance because he was pushing real hard, so I had to push as well. 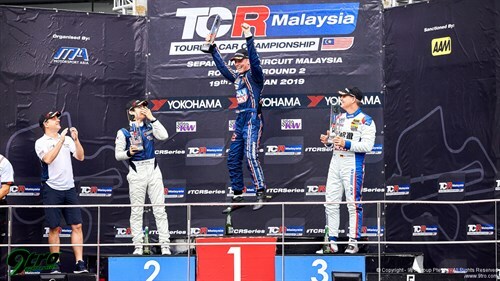 “[Race 2] After four or five laps I managed to gain the lead which was good because you don’t have the spray from the cars in front and then it was good to control the race. 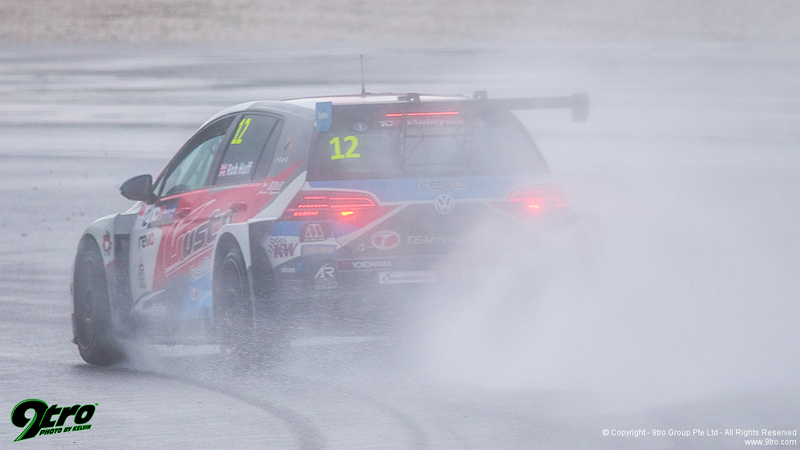 I tried to push as hard as I can to understand the tyres in these conditions, but it just felt perfect. 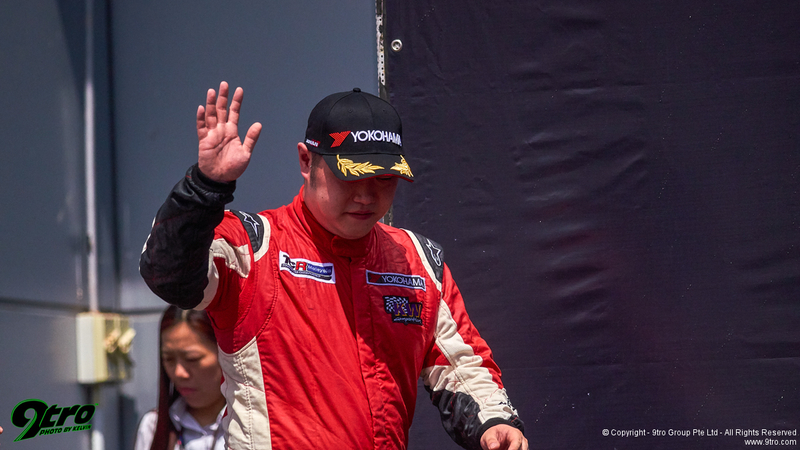 "The car was terrific. 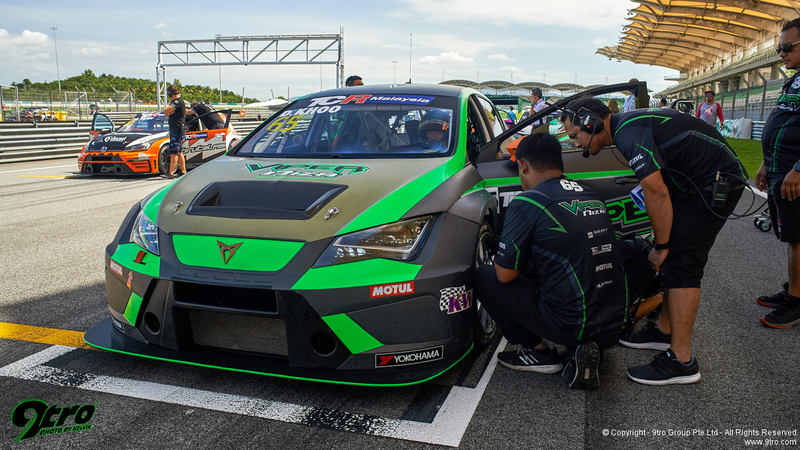 We kept our new tyres for qualifying so I knew we had the pace already, and to put it on pole position for the guys, and be over a second clear in Q1 was an awesome end to a very long Saturday, with qualifying at 8pm and at night. "Our race day wasn't quite as perfect. 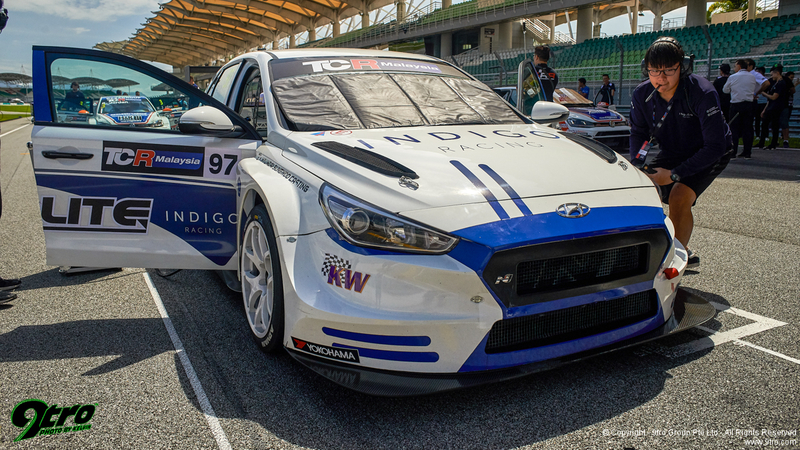 The Balance of Performance hasn't changed since last year, and we're also running 20kg heavier as I'm only doing this race, so the Hyundai getting ahead wasn't a surprise. 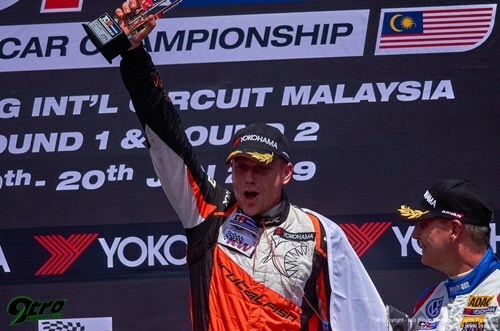 It's a tough circuit to pass on, but we made a good go of it and got our nose slightly ahead at one point but it was important to finish the race and not risk an accident. 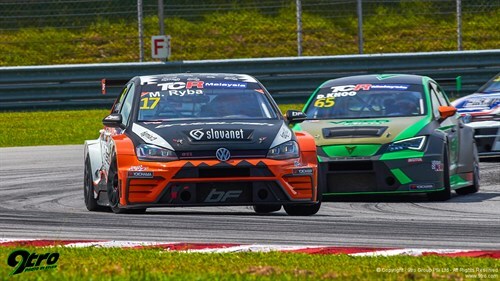 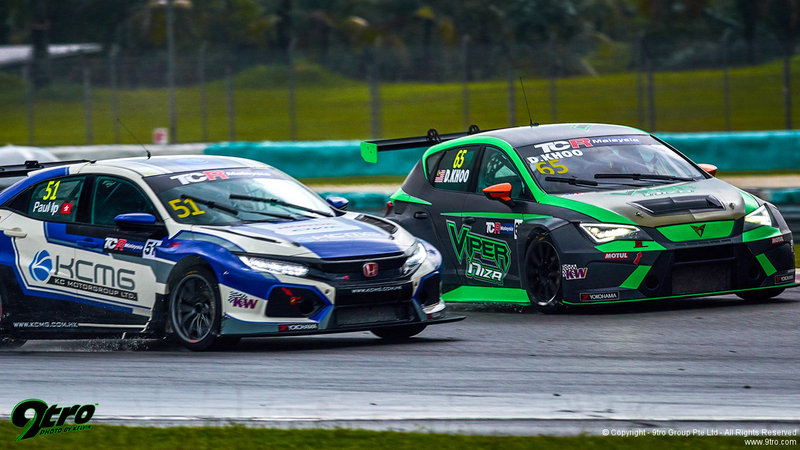 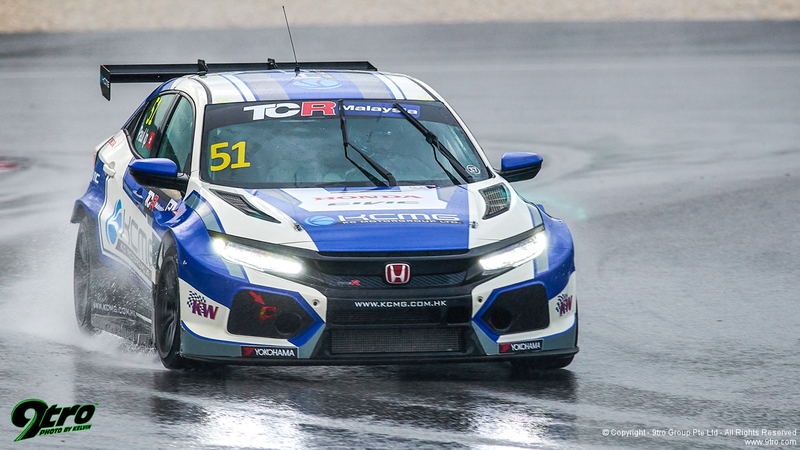 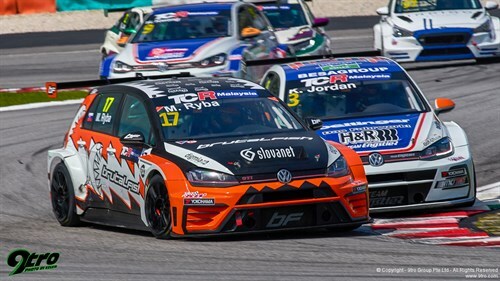 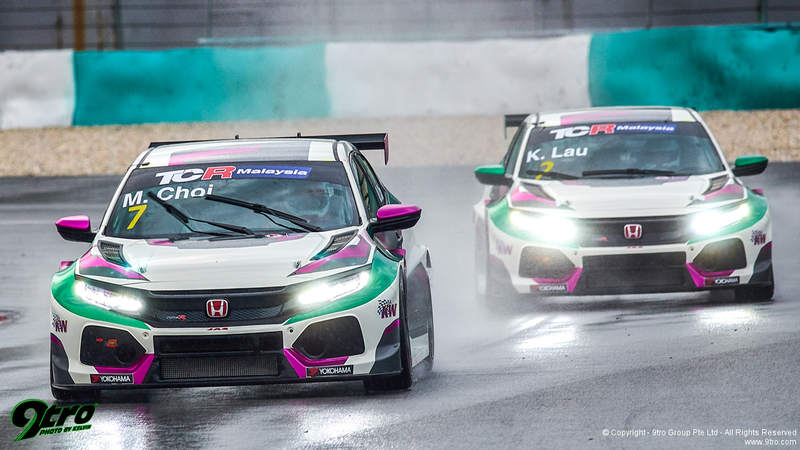 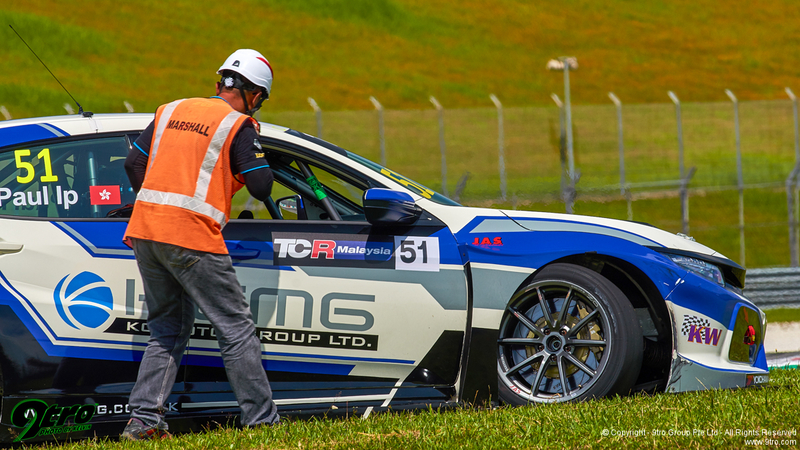 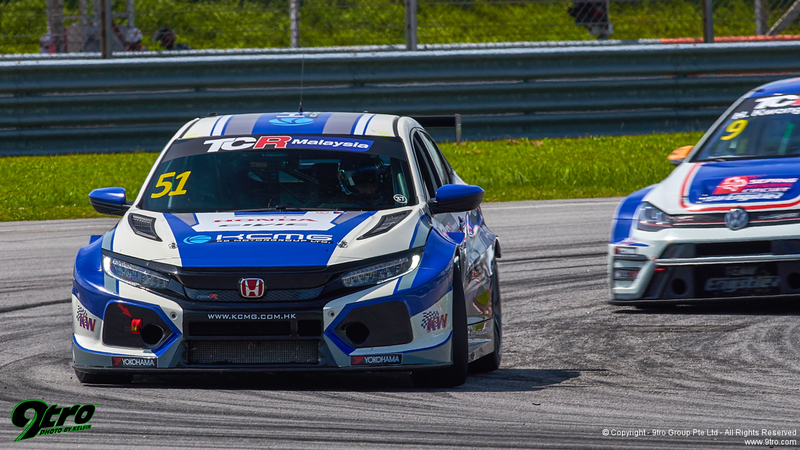 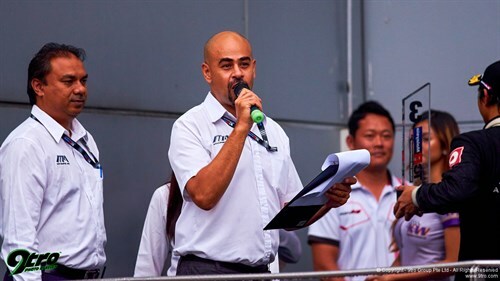 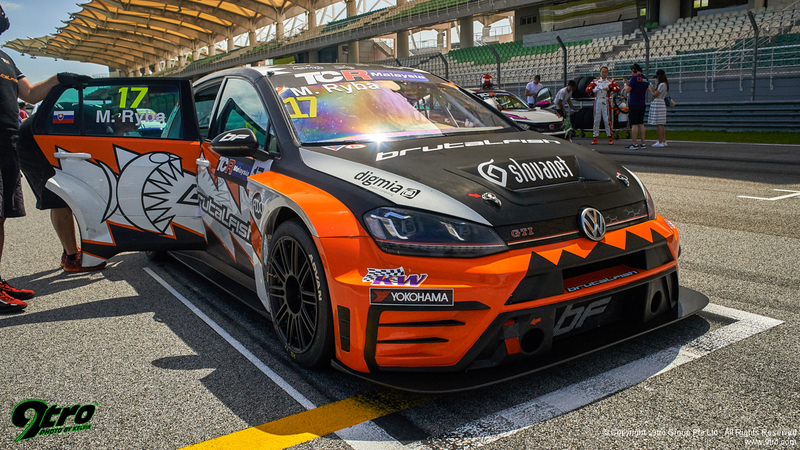 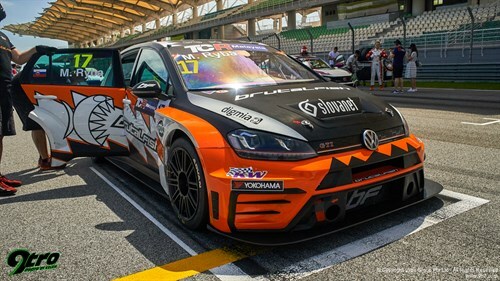 Rounds three and four of TCR Malaysia will be held again at Sepang International Circuit with a single day event that will see racing contested under lights.